Eye drops are used to administer different drugs in the eye (or both eyes). In some cases, eye drops don’t have to contain medications, and these products are used to replace tears or to lubricate the eyes. Other eye drops have some active substances to treat various eye conditions, such as dry eyes, dirt in the eyes, soreness or itching. Eye drops may contain: non-steroidal anti-inflammatory drugs (NSAIDs), antihistamines, topical anesthetics, sympathomimetics, parasympathomimetics or parasympatholytics, but also some beta receptor blockers, prostaglandins or steroids. Patients can differentiate classes of Eye drops according to the color of the top of the eye drop bottle, so they won’t mistake drops against allergies for artificial tear drops. Even though there are less chances that eye drops will cause adverse effects than some tablets, these drugs can cause unwanted effects. Once eye drops get into the blood, they are able to provoke certain side effects to different parts of the body and lead to headaches, dizziness or slow heart rate. Because of that, doctors advise pressing the inner corner of the eye for a minute or two after instilling the eye drops. Correct application of eye drops is crucial, especially for patients suffering from serious medical conditions like glaucoma, but also for everyone using any kind of eye drops. The easiest way is to have someone else put eye drops into your eye(s), whether it is someone from your family or a partner. Also, bring your eye drops to your next appointment at the doctor’s and he or she will show you how to use eye drops properly. However, for people using contacts or someone in need to apply eye drops for some time, it’s best to learn to do it yourself. You will need a mirror and clean hands, so, before starting, wash your hands with soap and water and dry them off. Remove the protective cap from the eye drop bottle and always check to see if the dropper is not chipped or cracked. If it is – it should not be used. Now, lie down or better tilt your head back. Holding the eye drop bottle with your index finger and the thumb, and resting remaining fingers on the cheek, pull lightly the lower lid and create a pocket. 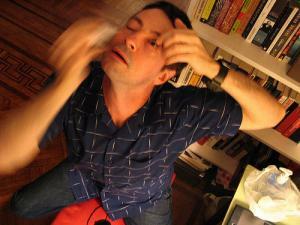 Now, place one drop from the bottle to that eye pocket, without touching the eye. Close the eye gently for a minute or two, to help the medication to be absorbed. Also, at the same time block the tear duct, to avoid any side effects. After that, replace and tighten the cap. Don’t wipe it or rinse it, and never touch anything with the dropper tip, because it’s not advisable. Sometimes, if you need to place 2 drops of eye medication in the eye, you should wait for 5 minutes after the first drop and then place the second drop in the eye. Why Do Knee Replacements Fail, And What Are The Symptoms Of Knee-Replacement Failure? Can long-term use of pilocarpine have negative effects? Chronic Posterior Blepharitis - Unusual Symptoms. Cost of thyroid scan and uptake in USA?